Phosphorus is a mineral that is important for healthy bones. Children with XLH have too little phosphorus, leading to weakening of their bones. 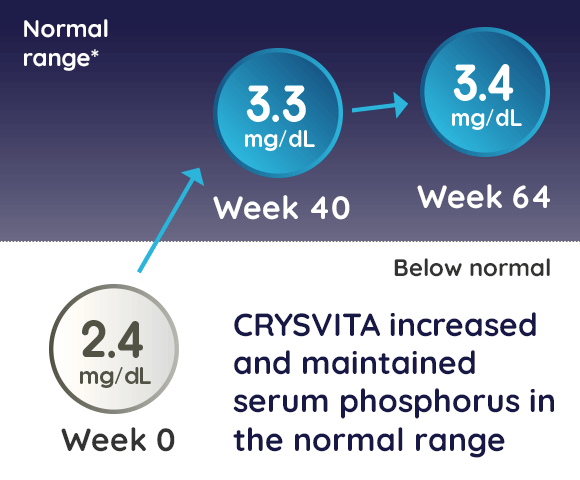 In 2 CRYSVITA studies, children with XLH were given CRYSVITA every 2 weeks, and the level of phosphorus in their blood, described as “serum phosphorus,” was measured at Weeks 40 and 64. In Study 1, 26 children with XLH aged 5 to 12 years received CRYSVITA every 2 weeks. In Study 2, 13 children with XLH aged 1 to 4 years received CRYSVITA every 2 weeks. *Normal serum phosphorus levels for this group of patients ranged from 3.2 to 6.1 milligrams/deciliter (mg/dL). The normal range of serum phosphorus levels varies by age and gender. 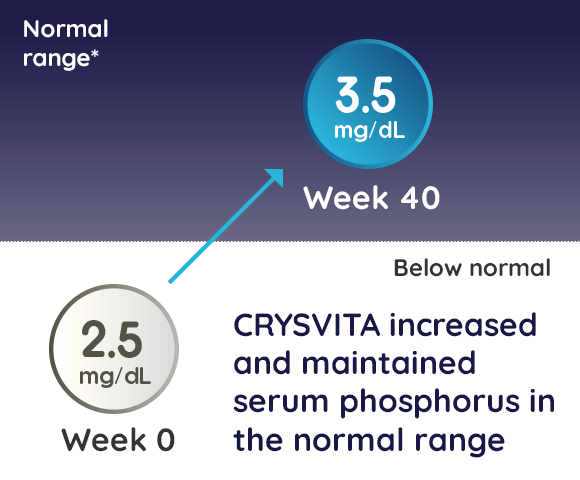 Talk to your child’s doctor about how CRYSVITA can help improve your child’s low phosphorus levels. At the beginning of a study of children with XLH aged 1 to 12 years (Studies 1 and 2), children had rickets of varying severity (as shown by X-rays). Patients were then given CRYSVITA every 2 weeks, and improvement of their rickets was examined at Weeks 40 and 64. These scoring methods use X-rays of the wrists, legs, and knees and are assigned by independent experts. *This number is from the Study 1 Week 40 least squares (LS) mean (SE) change of -1.1 (95% confidence interval [CI]: -1.28 to -0.85). LS mean is a statistic that estimates the mean after adjusting for the effect of other variables in the study, and the 95% CI is a range that includes possible values of the mean reduction in RSS. †This number is from the Study 1 Week 64 LS mean (SE) change of -1.0 (95% CI: -1.2 to -0.79). Note that mean RSS (SD) at baseline was 1.9 (1.17). 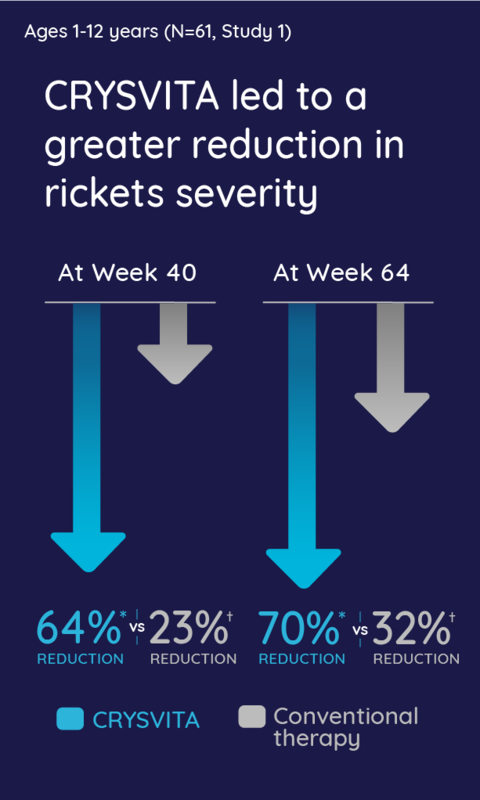 In Study 1 at Week 40, 18 out of 26 (69%) patients achieved substantial healing (RGI-C ≥+2.0) of their rickets after receiving CRYSVITA every 2 weeks. This improvement was also maintained at 64 weeks. *Substantial healing is defined as having an RGI-C score of ≥+2.0. *This number is from the Study 2 Week 40 least squares (LS) mean (SE) change of -1.7 (95% CI: -2.03 to -1.44). Note that mean RSS (SD) at baseline was 2.9 (1.37). 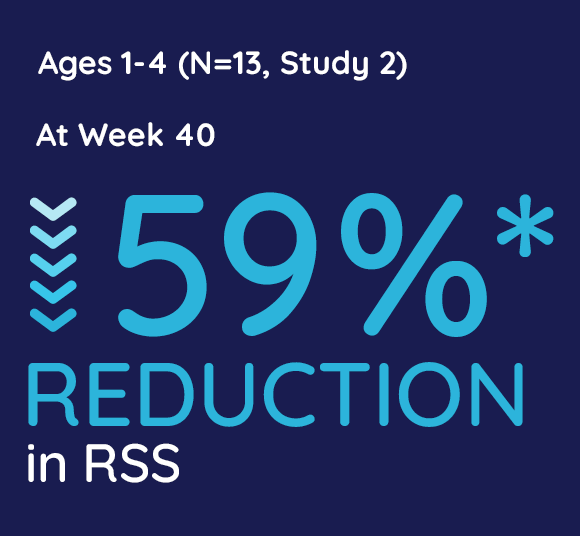 In Study 2 at Week 40, 13 out of 13 (100%) patients achieved substantial healing (RGI-C ≥+2.0) of their rickets after receiving CRYSVITA every 2 weeks. These patients also demonstrated improvements in lower limb deformities. Talk to your child’s doctor about how CRYSVITA can help heal rickets. In the study of children aged 5 to 12 years (Study 1), the majority of children with XLH were below the average height for their age. They were then given CRYSVITA every 2 weeks for a total of 64 weeks, and their height was measured again to evaluate changes. Standing height z-score was used as a measurement of growth. 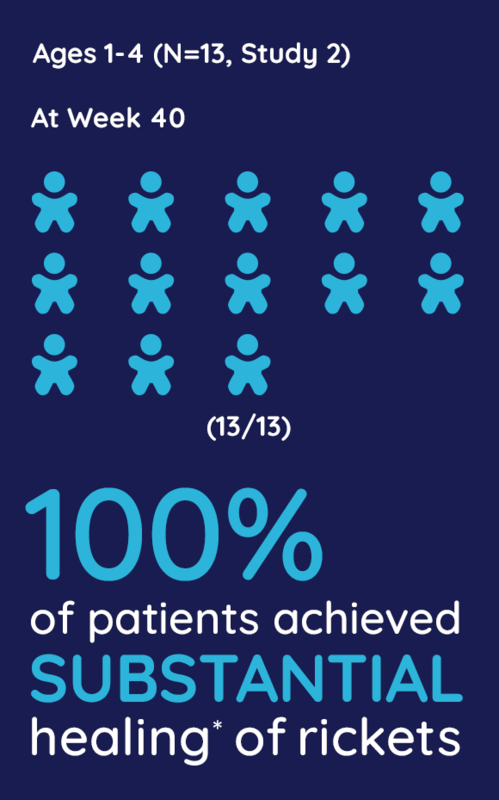 This measurement is standardized according to the reference age and gender of children without XLH, as defined by guidelines from the Centers for Disease Control and Prevention (CDC). *In Study 1, CRYSVITA treatment for 64 weeks increased standing mean (SD) height Z score from -1.72 (1.03) at baseline to -1.54 (1.13) in the patients who received CRYSVITA every 2 weeks (LS mean change of +0.19 [95% CI: 0.09 to 0.29], an increase of 11% [0.19 is 11% of 1.72]). LS mean is a statistic that estimates the mean after adjusting for the effect of other variables in the study, and the 95% CI is a range that includes possible values for the change in height z-score. 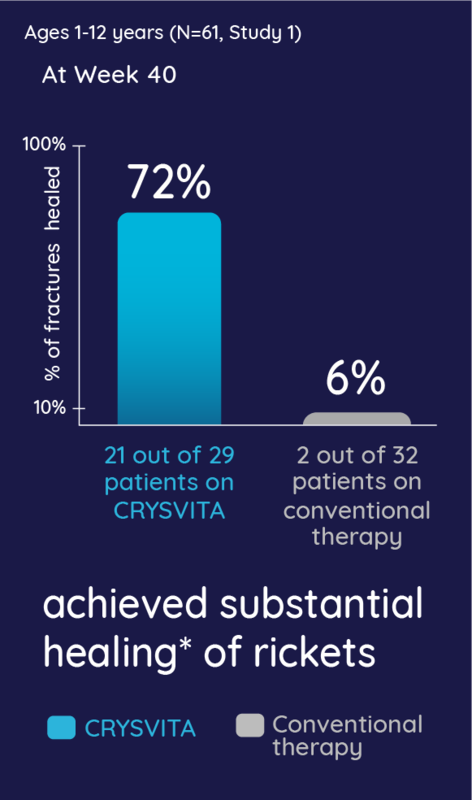 At Week 64, CRYSVITA led to an average of 11% increase in height z-score. Talk to your child’s doctor about how CRYSVITA may help your child grow.